Vertical band saws (often called contour saws) are different than horizontal saws in that the blade is kept stationary while the material is moved manually against it by the operator. Horizontal band saws, in contrast, move the saw blade down through securely clamped material. JMT primarily offers a wide line of horizontal band saws, ideal for most aspects of metal fabrication work. While we don’t regularly stock vertical band saws, we can special order them from several of our partners for interested customers. Vertical band saws are useful for making complicated cuts like shapes and curves in a work piece, but horizontal band saws work far better for cutting metal that is large, hardened or in bundles. If your wood or metal working shop is lacking a JMT vertical band saw, you’re selling yourself short for many reasons. These band saws are ideal for when you need accurate, low-maintenance cutting that can get the job done without the use of other material handling products. You can slice through materials such as miters, parallelograms and trapezoids with ease, creating precise vertical cuts without changing the characteristics of your material. Using a programmable controller, you can apply the same cut continuously to achieve exactness that is perfectly on-size every time. Another benefit to using band saws is the absence of a heat effected zone which helps save you time and tooling costs, resulting in a longer blade life than other band saw types. Our vertical saws are unaffected by forces of gravity due to their upright position and can in turn maintain feed pressure to produce straighter, more concise cutting. The vertical tilt of the band saw frame assists in faster and easier cutting of miters, while creating a straight line of feeding for materials. 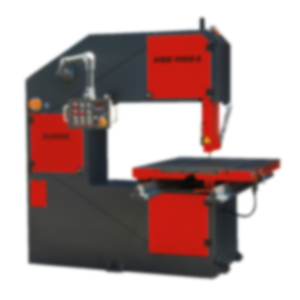 With a vertical band saw you have the ability to cut in both directions from a 90 degree angle, something that few other machines can offer. You can also cut smaller pieces with low impact without shaking for smooth, quality cutting you can rely on.